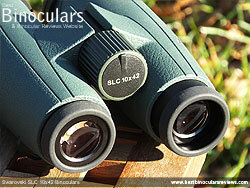 The SLC 42 Series is described by Swarovski Optik as "multipurpose binoculars for observing wildlife", which apart from being Slim, Light and Compact, their main strengths and indeed aspirations are to be as tough and durable as possible, offer a very high quality, but also high contrasting image with a wide field of view. It is because of these core strengths, the 42mm Swarovski SLC binoculars tend to appeal to the needs of people like adventurers, general wildlife observers and hunters. To me it also looks like they could be a great option for birders who perhaps do not quite have the budget needed for the flagship EL series. 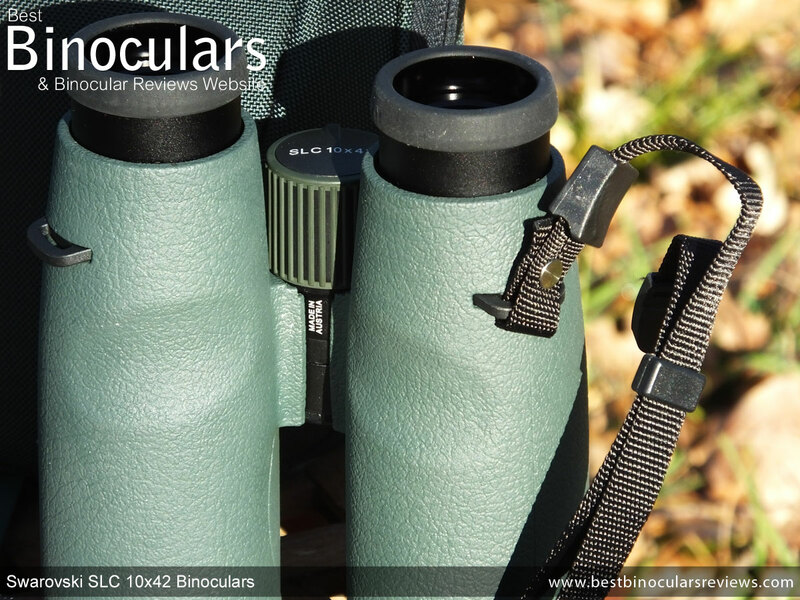 As you will read in this Swarovski SLC 10x42 binocular review below, I take a really close look at all of their components, specifications as well as give you my perspective as to their optical performance, all the time keeping a close eye on the similarities as well as differences between these and the EL series to help those who are undecided as to which is a better choice for their specific needs. Produced in their facility in Austria, the most obvious difference between the EL and these SLC's is their body shape. The bridge is fairly thin and is positioned a fair bit close to to the eye-pieces than the objective lenses. This frees up more of the ends of the barrels and thus gives you a little more to hold onto, which makes them nice and comfortable when glassing, but also makes them more secure to grasp when walking. This may seem like a small point and not worth expanding on, but for those who have to clamber about over difficult terrain whilst in search of wildlife, it can be really important. For example on safari, I often make my way through quite thick bush, up and down steep sections and often over large boulders. All the time carrying my binoculars as well as my camera (hunters will have their weapon). To have your bins simply swinging from your neck is not good enough as they will most certainly get damaged. Thus if I am not using a harness, I often find myself carrying them in one hand and protect my camera with the other and this is why a good grip like these provide is for me an essential feature. 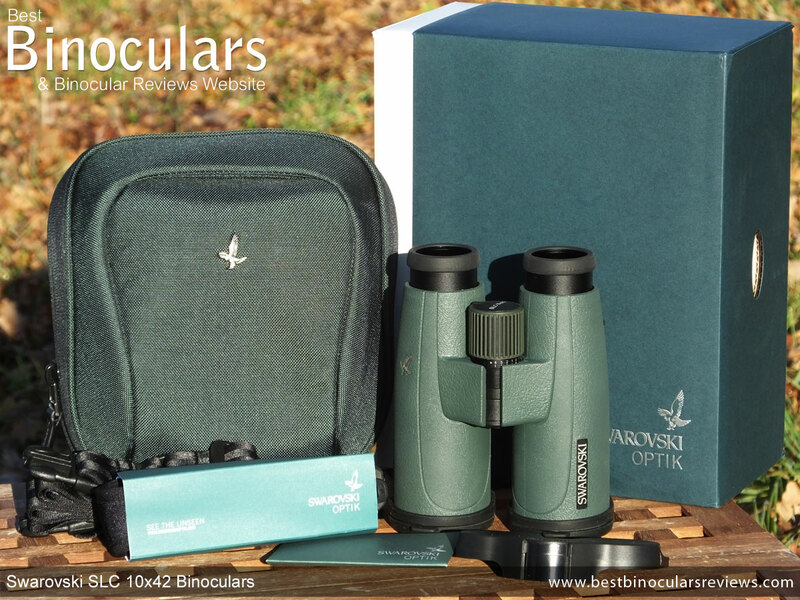 The first area where we discover that Swarovski Optik mean business in their quest for a tough, lightweight, yet quality binocular is their use of Magnesium as the material for the housing. 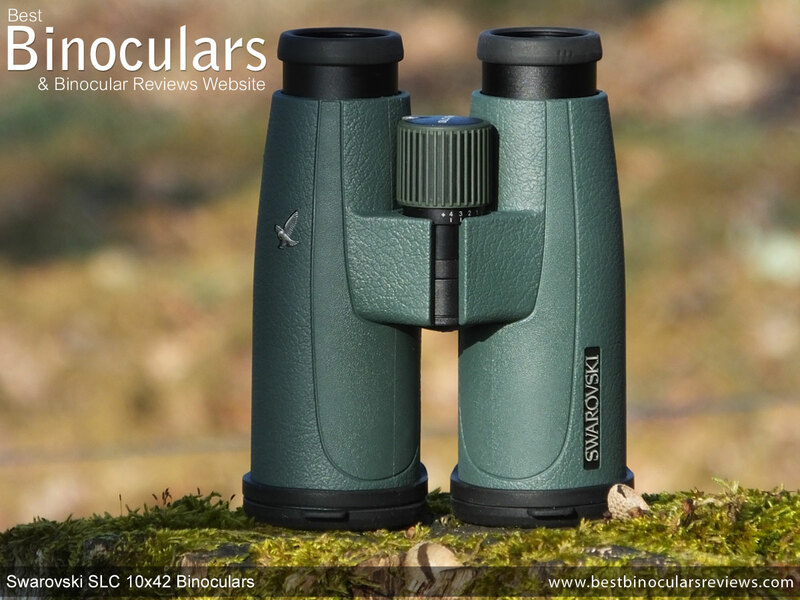 Magnesium is stronger than the most commonly used and cheapest option of Polycarbonate and whilst it may not be quite as lightweight, it has a density of only two thirds of Aluminum and so is lighter and thus is the choice for most of the very best binoculars out there. 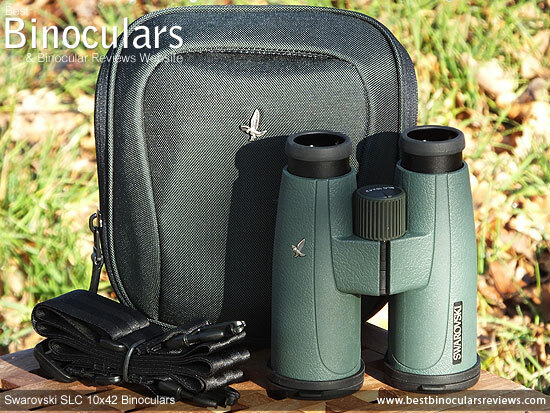 As you would expect to discover, the Swarovski SLC 10x42 binoculars are fully sealed and are thus both water and air-tight. Whilst they do not offer a recognized industry standard rating in their marketing, Swarovski say that they can be submerged in water to a depth of 13ft / 4m with compromising the seals. Remember that as well as protecting them from moisture, this will also safeguard the internal optics in dry and dusty areas. Whilst Swarovski Optik do not got into specifics as to the exact gas, they do state that there is an "inert gas" filling the inside the device. 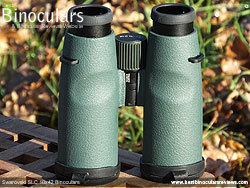 So I am not sure as to if it is Nitrogen, Argon or something even more exotic like the blend of Argon and Krypton that Leupold Optics use in some of the models, but as you can read in this article on Fog & Water-Proofing in Binoculars, for the most part it does not really matter as all seem to do good enough job of preventing the internal glass surfaces from misting up. The rubber coating that covers almost the complete exterior of the binocular is looks to be both very tough and quite thick, providing plenty of protection to the delicate parts inside. Whilst this armouring is quite hard and so perhaps does not offer quite as much cushioning as some, along with the finely textured exterior it still presents a surface with plenty of grip. As well as protection and grip this non shiny and thus less reflective exterior helps to keep your position hidden. The sound dampening that the rubber offers is also an important quality for those needing to be as stealthy as possible. 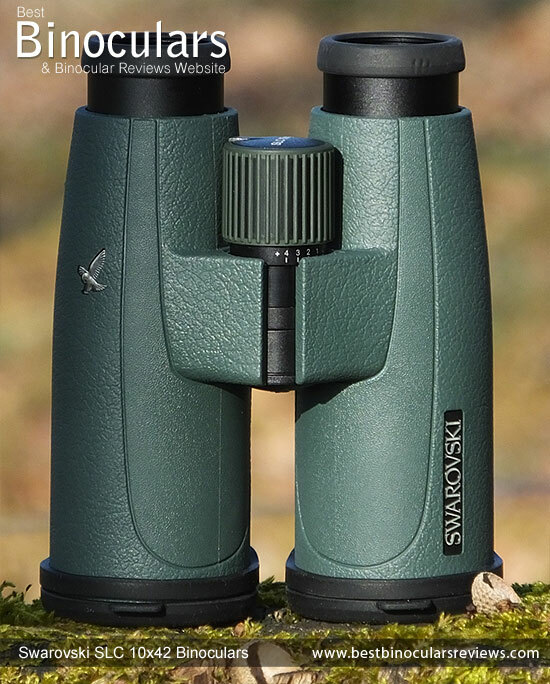 On the underside of the body, Swarovski Optik have moulded two thumb indents. These are well positioned and I found that my thumbs naturally gravitated towards them and thus just did enough to help me hold them in exactly the right way and spot to get a perfectly balanced setup. At a depth of 13mm, the objective lenses are set comparatively deeply within the ends of the barrels. This may not help make for the shortest body in the world, but it does provide the lenses with plenty of protection from being scratched as well as keeping them sheltered from light rain and falling dust. Remember the longer your lenses stay clean for, the less often you have to clean them, which in turn means less chance of you damaging them and therefore ensures your pristine view is maintained for longer. Positioned in the traditional location, on the side of each barrel are the loops through which you thread the neck strap through. These look to be part of the same mould as the rest of the chassis and thus are very secure and look like they will break very easily. By removing the small dust cap on the front of the bin with a small coin (rather than unscrewing it in the more usual way), it exposes the small teeth used for Swarovski's own quick release adapter, but they have still also thankfully kept the standard thread which you can use to screw in most standard tripod adapters. One aspect to keep in mind however is that there is not a huge amount of room between the barrels and this combined with the fact that the bridge is set far back from the ends of the barrels, means that you may have some difficulty fitting some adapters into the gap. However as you can see from the photos, I was able to use my Vanguard one, which is of a similar design to many others out there. Without doubt this is one area on these binos that beats that of most others out there. Made from metal, they are not only far more classy looking, but undoubtedly stronger as well. On top of this the actual eye-cup housing can be unscrewed and replaced should you ever need to. As this is one of the most vulnerable external areas on a bin, it is a part that takes the lions share when it comes to the parts of a bin that do get damaged (especially when dropped) and thus it make's sense that it can be easily replaced. The metal shell has a small rubber padded area on the end for comfort and whilst this is quite hard and the diameter of the eyecup (38mm) is perhaps a millimeter or so less than some, I never felt any discomfort whilst using the bins, even when pushing them quite firmly against my face to get a really steady view. Twisting up and down the eye-cups is nice and smooth and there is no undesired free-play or movement of any sort. There is also one fixed stop situated between the two extremes, which provides a little flexibility for some, although most non eye-glass users will simply have them set at fully extended and fully twisted in for those who wear glasses. Also there is easily enough friction to movement for you to position the eye-cups at any point should you need to and they should remain in position. By opening and closing the central hinge, you can adjust the distance between the eye-cups to match that of your own eyes. 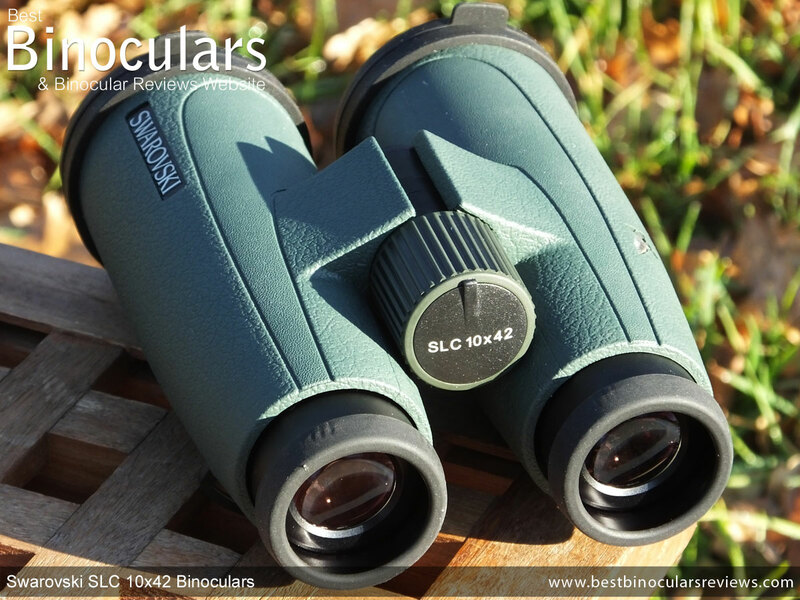 These Swarovski SLC binoculars have a minimum IPD setting of 5.6cm and a maximum of 7.4cm, which as you can see by comparing the IPD with others is a good range for a bin in this class and means they should accommodate most people. Centrally located on the rear of the hinge is the focus wheel. Whilst the one on my test pair worked very well: it turned smoothly, without any sticking points or undesired free play, I would have to say that being made from plastic it just lacks a little in terms of class when compared to the rest of the binocular, especially the eye-pieces. This is mostly an aesthetic thing and metal ones, apart from feeling more robust and solid do not really work any better. At 29mm in diameter, the wheel is also a few millimeters smaller than that I most often find on a full-sized bin. However because it protrudes nicely above the barrels, turns smoothly and has a deeply grooved track running across it, I never had any problems in firstly reaching it or accurately adjusting the focus, even whilst testing with my gloves on. In my experience, I would describe the focus mechanism as being lowly geared, by that I mean it takes just over 2 turns (730° of rotation) of the wheel to adjust the focus from one extreme to the other. The advantage of this is that it is in theory easier to make fine adjustments to the focus to get it spot on, but on the flip side, making large changes in the focus takes a little longer than those that require less turning of the wheel. 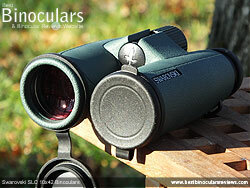 For a number of reasons, I really love the diopter adjustment on the Swarovski SLC 10x42 binoculars. Unlike most bins that have a ring positioned near the right eyepiece, you use the central focus wheel to calibrate your bins to match that of your eyesight. To do this you have to engage it by pulling the focus wheel back, it then clicks out to reveal the easily readable scale. This scale is the first feature that sets this diopter apart as most manufacturers simply have a central point indicator, thus if your setting in not neutral and you want be able to quickly return it should it move, then you have to create your own mark. Once engaged, you simply turn it as you would the focus wheel, but rather than turning with a smooth action like the standard focus mechanism, the diopter turns with a very fine ratchets, which lets you know that you are adjusting the diopter. Then once you have set up the binocular to match your eyesight, you lock the diopter setting in place by clicking the wheel back in place. Having a lockable diopter is another small but nice feature that is missing from way too many pairs of optics out there. 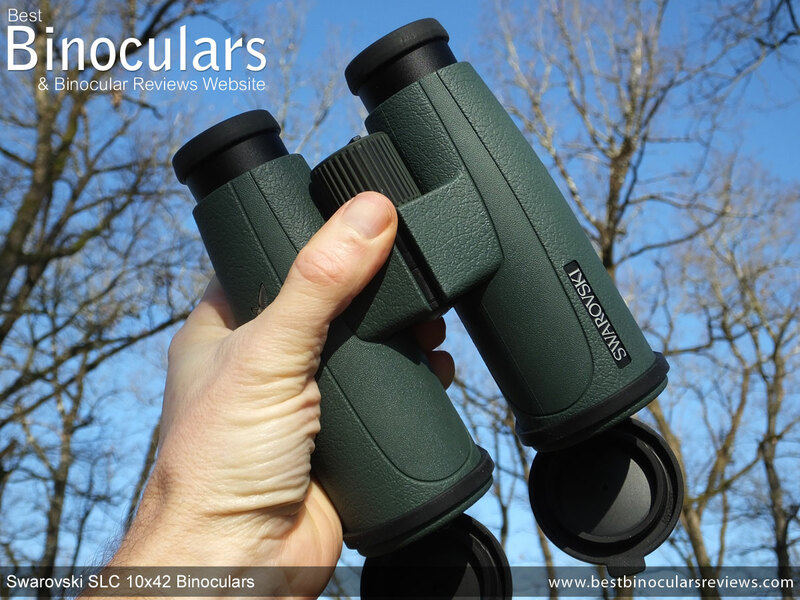 So as you can see they are a little heavier than many other 42mm binoculars out there, but are still a little lighter than the EL's and far from being the heaviest of all. I think for me their weight is in no way excessive and the overall balance of them feels good. Besides I would rather carry a little extra weight and be safe in the knowledge that what I am holding is a quality instrument made using mostly metal parts, rather than a very lightweight, cheap looking and feeling plastic pair. I can also confirm that their advertised weight is accurate, I weighted my test pair and they came to 794g without the neck strap or lens covers on. With lens covers and neck strap, this increases to 897g. The official dimensions of the Swarovski are pretty much in line with the majority of other full sized roof prism bins on the market. For accuracy, I measured their length as 14.4cm with the lens covers removed and the eyecups twisted in. Twisting out the cups increases it to 15.1cm and then by adding the objective and ocular lens covers their maximum length is 16cm. Their width with lens covers on and the IPD set to maximum is 13.5cm. by closing the hinge this reduces down to 11.6cm. Likewise their height with the hinge open is 7.3cm. Note this includes the lens covers and the tabs and rubber loop on them. 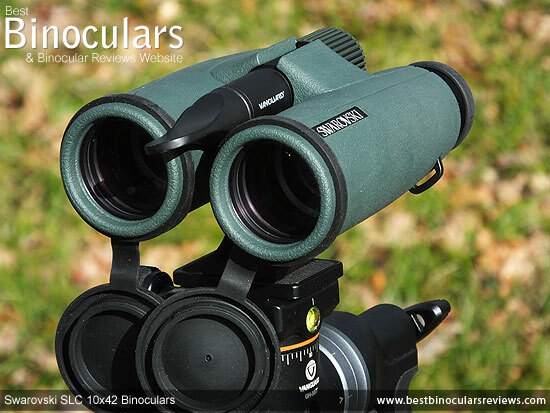 By removing the objective lens covers their height decreases to 5.3cm. Closing the central hinge increases their height measurement to 7.1cm. No details on the make-up of the lenses in the eyepiece, so all I can say is that after measuring the ocular lens, I found them to be 21mm in diameter, which is perhaps a millimeter smaller than the majority that I have measured on 42mm binoculars. However where I think these do differ to the EL range is that Swarovski do not advertise that they use their Swarovision technology, which I will take to mean that they do not use field flattener lenses as which is found in the Swarovski EL 10x32 for example. When Swarovski Optik updated the SLC range a few years back, one of the biggest improvements was to add their HD optical system to the range. This means that these now contain an extra-low dispersion glass element within the objective lenses. This is fairly common these days, but where Swarovski's are a little different to most is that this element is made using fluoride. Whilst not the cheapest or easiest to use, Fluoride is generally considered to be the best extra-low dispersion material to better direct the wavelengths of light and thus even better at reducing or virtually eliminating chromatic aberrations to deliver a sharper image with less (or even no) color fringing around the edges of the view. 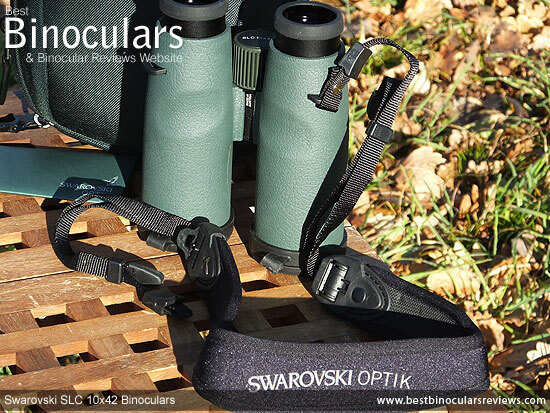 These Swarovski binoculars use roof prisms to erect the inverted image and to the best of my knowledge, these are made using BaK-4 glass. 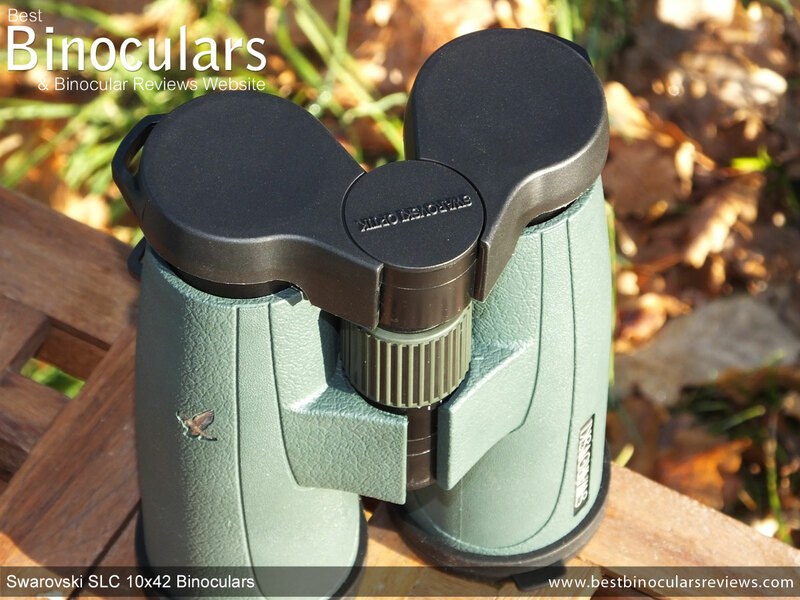 All Swarovski SLC binoculars are fully multi-coated with anti-reflection coatings to ensure as much light as possible gets through the optical system as possible. This means that they have added these coatings to every single air to glass lens surface and which they claim can reduce the amount of light that gets reflected away from about 4% - 6% to almost nothing (0.2%). The result is brighter, better quality images. The exterior lenses have Swarovski's Swaroclean Lens coating added to them. This non-stick material not only means less debris will cling to the lens, but it ensures that when you clean them you do not have to apply as much pressure. At first this may not sound like a big deal, but remember making it easier to clean away oil, dirt and water marks from your lenses means you have a much lower chance of damaging or marking the sometimes delicate coatings. To increase the reflectivity on the surface of the roof prism that does not reflect all the light that arrives at it, manufacturers will sometimes add a highly reflective mirror coating to it. Aluminum mirror coatings are the cheapest option and will increase the reflectivity on this surface up to about 93%. Better still are the more expensive silver mirror coatings that are said to reflect around 95% to 98% of the light that arrives at this surface. Swarovski advertise that they use their Swarobright coatings on the SLC range, which if I am not mistaken is their marketing for the very best dielectric coatings that reflect as much as 99% of the light. As well as these mirror coatings, phase correction coatings, which Swarovski call this their P-Coating are added to the roof prism, which corrects "phase shift" and thus results in a better image resolution and contrast. Note: If you are specifically after really wide FOV, you may be better opting for the 8x42 SLC, which boasts a massive FOV of 408ft @ 1000yards. I rate a minimum focus of under 6ft as being excellent, thus at an advertised 10.5ft, you can see that these Swarovski binoculars fall way short of that and thus would probably not be the ideal choice should you spend a lot of your time observing insects or flowers at very close ranges. Note I measured the minimum distance that I could focus on something with my test pair as being 2.67 meters (8.8ft) which is substantially closer than the advertised minimum, but still falls a little short of what I would call excellent. At 16mm, the amount of eye-relief should just be enough to ensure that most eye-glass wearers are able to view the full image, but as you can see from the table above you do get a little less than some. In an effort to be as consistent as possible, I use the same pair of "control", mid level 10x42 binoculars to compare the view to that of the bin under review. For this test I carried out these tests twice, once on an overcast morning and then again in even poorer light just at and after sunset. I love the image that you see through these Swarovski's. The colours to me are very vibrant (even on a dull morning) and stood out a little more than my controls, but not so much so that the view looks unreal. As expected, the overall image is neutral and natural looking and lacks any unwanted tinting that you can sometimes observe. Likewise I thought that the image contrast was strong, with a good differentiation between dark and light areas, but once again not so strong as to make the image look unnatural. During the morning, the brightness between these Swarovski SLC 10x42 binoculars and that of my controls looked to be equal. In this light this is to be expected your eyes are being supplied with more than enough light to make a good image. In poor light at the end of the day was where I though that these Swarovski's and their superior quality glass and coatings came into their own and really excelled. 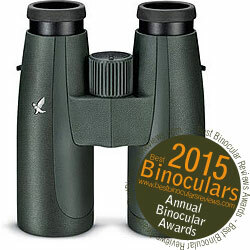 For a 10x42 binocular I would rate these up there with some of the brightest that I have looked through. However should you really need excellent low light performance, you would probably still be better off with the larger exit pupil that you get with the 8x42 version. 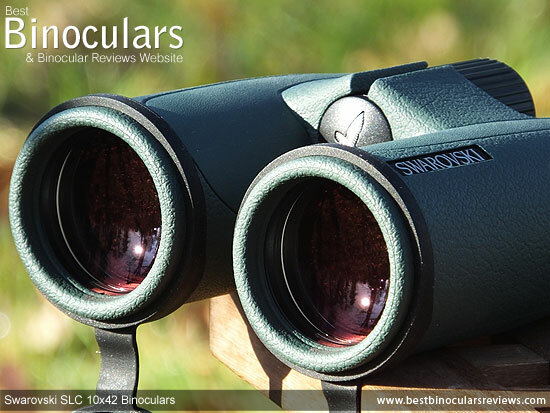 The HD optical system on these Swarovski binoculars does an excellent job of limiting chromatic aberrations as the view is almost completely free of any conspicuous color fringing. Under normal use, I never noticed any color fringing and it was only when I was looking for it and really put the optics to the test by doing things like focussing on a black telephone line lit up by a bright sky in the background that a thin line could be observed around the edges. This amount is very minimal and far less than most binoculars including those that use ED glass and thus I rate these Swarovski SLC's very highly in this area. Another very impressive aspect of the view through these 10x42 Swarovski SLC binoculars is just how little (almost zero) softening there is of the image, even right at the edges of the view. These Swarovski binoculars showed no signs of the distortions that causes the image to look like it is curving inwards or outwards and to me looked perfectly flat and remained in focus from edge to edge. The carry case or "Field Bag" that you get with the SLC is exactly the same design as the one you get with the Swarovski EL models and is the only manufacturer I know of that includes separate instructions on how to use it properly!. Whilst I suppose it is technically a soft case, it comes with more than enough padding and support to ensure the optics inside are protected from everything but being crushed by a very heavy object. 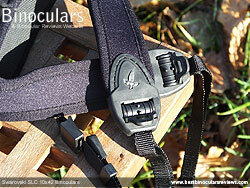 The Swarovski field bag comes with it's own carry strap. Unlike the neck strap, it is un-padded, but can be adjusted for length and attaches to the bag via the two quick release clips located on the rear. It is designed so that you can either carry it over your shoulder or round your neck in the traditional way, but you can also use it like a belt and carry it around your hips. To get inside the bag, or to keep it closed, there is a long Zipper that runs the length of the two sides and over the top of the bag. 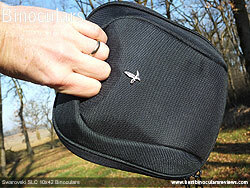 For me a Zip is the most secure way of keeping the carry bag closed, but unlike a magnetic or quick release clip, you do have to be careful so as not to make too much noise when opening it should you wish to stay hidden or prevent yourself from flushing out birds and even larger wildlife. Hidden from view, but located on the top of the front face of the bag is a small recess that is designed to be used should you wish to carry the bag in your hand rather than using the strap. I really like this and found that I would use it a lot. Inside the bag there is a divider that keeps the binoculars and your accessories or what ever else you wish to carry apart and there are also two pockets. Once quite simple and the other an elasticated mesh one. A point to note about the bag is that the binoculars fit perfectly into the case, not too loose so that it rattles about and not so tight that it is hard to get in or out. This fact remains true when you include the neck strap and have both the ocular and objective lens covers on and the eye-cups fully extended. I can't tell you how annoying it is to have to twist in the eye-cups every time you wish to place your optics into it's bag, so whilst this may be a small detail it is something that can really start to annoy after doing it all day long when out in the field. This I am really glad to see that Swarovski have not made this mistake that so many others do. The Swarovski neck strap is most certainly one of the very best that I have used. Not only is it exceptionally well made, but comes with a very good level of padding - it is 5mm deep. The padded section, whilst not the widest (1.6in / 4.1cm), is curved and shaped so that it fits perfectly around your neck and shoulders which definitely adds to the comfort. Rather than using the standard and rather hit or miss plastic slider that you find on most bins, the nylon cord has a metal pin on the end of it and you simply thread the cord through the loop on the bin and then push the pin through the two slits in the nylon cord. Then to keep it all in place and to make it look really neat, you slide a small plastic sleeve over it. This system works incredibly well and I found that it was far quicker and more secure than the usual slider. To adjust the length of strap you simply flick the small tab located at the junction between the padded and nylon sections of the strap This then releases the break allowing you to quickly and accurately change the length of the cord for a perfect fit. Made from plastic, the eye-piece cover or rain-guard is like the other accessories: excellent. Rather than a simple, flexible bridge connecting the two cups, Swarovski have designed it with a lightly ratcheted central hinge and whilst this maybe slightly over engineered, it works well enough and means that you can fix the guard to the eyecups no matter what you have set your inter-pupillary distance at. The cups on the guard fit nicely over the eye-cups on the binocular, and by nicely I mean that they are just tight enough to stop them falling off to easily, but not so tight as to make replacing them tricky. The rain-guard also has a loop on each cup that you can push the neck strap through, if you wish. 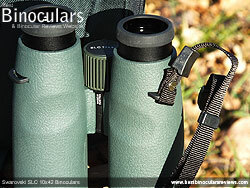 The soft rubber objective lens covers are simple but very functional. The rubber used to make them is somewhat thicker and I would say tougher than that I see included with the majority of bins that I review. The fit onto the barrels is excellent as they fit to the binocular both on the inside of the barrel and over the top. These "dual" contact areas create a far better and more secure grip than the "single" ones that I usually see and means far less chance of them coming away accidentally. Once again this is a very small point, but which shows that Swarovski Optik have really paid attention to the finer details on this product. The covers are also attached to each barrel with a separate loop that goes around it. I really like this simple system as you can quickly remove the cover when you need to, yet they are always there hanging under the binocular and out of the way, yet cannot be lost. The top of the cover also has a small flap that makes it just a bit easier to flip open the cup at any moment to begin glassing. Whilst most binoculars you get come supplied with a simple cleaning cloth, the quality of the one that you get with the Swarovski SLC binoculars is way superior than most. On top of this you also get a single use, moistened cleaning tissue for the lenses for emergency use when out in the field. As good as the cloth is, I would still highly suggest that you invest in a good quality and specifically designed Lens Cleaning Kit for binoculars or camera lenses that will ensure that you can properly clean the lenses without marking them or their coatings. The Swarovski "Instructions for operation" comes in the form of a small booklet that is attached neatly to the inside cover of the display box and even though it is written in a number of languages, it is far more comprehensive than that I normally come across. It includes a diagram naming all the parts, how to correctly attach the carry strap, adjusting the eye-cups, interpupillary distance adjustment, focussing, dioptric compensation, attaching a tripod, maintenance, cleaning, storage and general information. There is also an included specifications chart and on the back cover is the warranty card and details of the worldwide 10 year guarantee. Strong Points: As with ever other Swarovski binocular that I have reviewed, the calibre of the build on these is excellent and pretty much as good as it gets. This high quality build, continues through to the optics and their coatings, which all combine to deliver a stunning image quality that I really cannot fault. 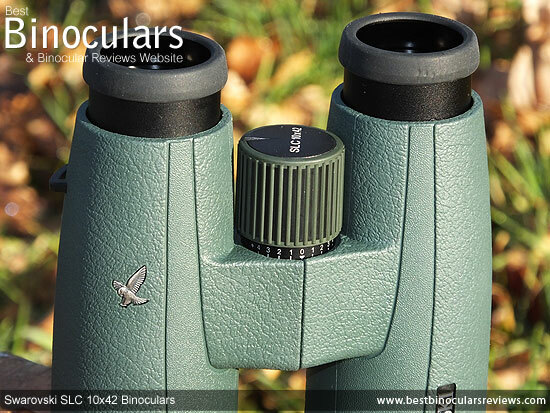 The attention to detail is spot on and the very high level of the binocular is complemented by the excellent accessories that comes included. This includes the carry bag, neck strap, lens covers and even the cleaning cloth that are as good as or better than anything you get with any other product. Weak points? Whilst it is not a weak point as such, I am surprised to find that the focus wheel on these is not made from metal like the eye-cups are for example. Sure the plastic one works well enough, but for me it just lacks a little and would have made the instrument look a little more classy had it been all shiny and metallic! The minimum close focus on these is relatively far, which for most people will not be a problem at all, but if you often like viewing flowers or insects from close range these will not be the set for you. Weight wise, they are a tad heavier than most 42mm bins, but having said that, their weight really was never a problem for me and I would much rather be carrying a few extra grams about, but safe in the knowledge that I have in my hands a very high quality instrument made from premium quality materials, rather than a very lightweight plastic one. 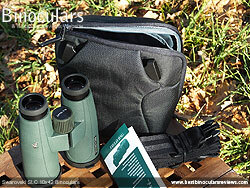 Ideal Uses: As Swarovski advertise, for these are a perfect multipurpose set of binoculars. 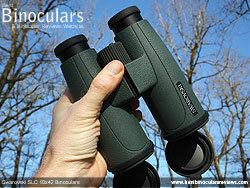 For a full sized binocular they are reasonably compact and whilst not the lightest, are also not too heavy. The 10x magnification gives you just that little extra reach, yet you still get a view that is wide enough to easily spot and then follow birds and larger wildlife. For most types of birding ,hunting and just viewing larger wildlife they will be more than adequate, but will perform best in open areas and over larger distances. 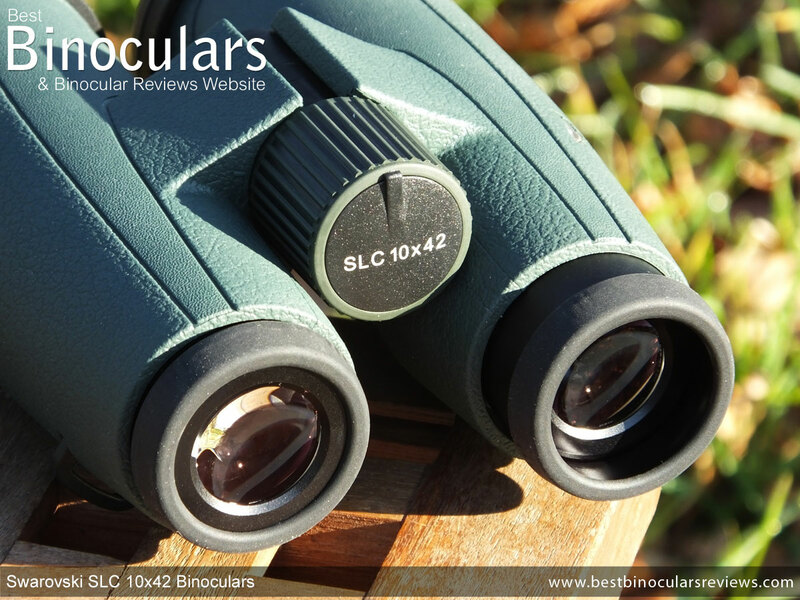 If you do most of your birding, hunting or wildlife observation at closer ranges and in darker conditions like forests or after sunset then you may be better of selecting the 8x42 SLC instead. Whilst the body is submersible, I would hesitate to recommend them for most marine uses, this is mostly because the higher magnification means that unless you are always on still water it may be quite difficult to keep the image still and you's be far better off with a lower 7x power that most dedicated marine binocular employ. Just a quick paragraph to re-assure you that unlike many so called "reviews" you find out there, I wrote this review after thoroughly researching, using, testing and comparing these Swarovski SLC 10x42 binoculars with others that I own. The thoughts on this page are my own and are my honest opinions of the product. I am in no way directed or asked to write in a specific way. Occasionally I make a mistake or two or I am supplied with incorrect details, if you spot an error, please feel free to contact me so that it can be corrected.